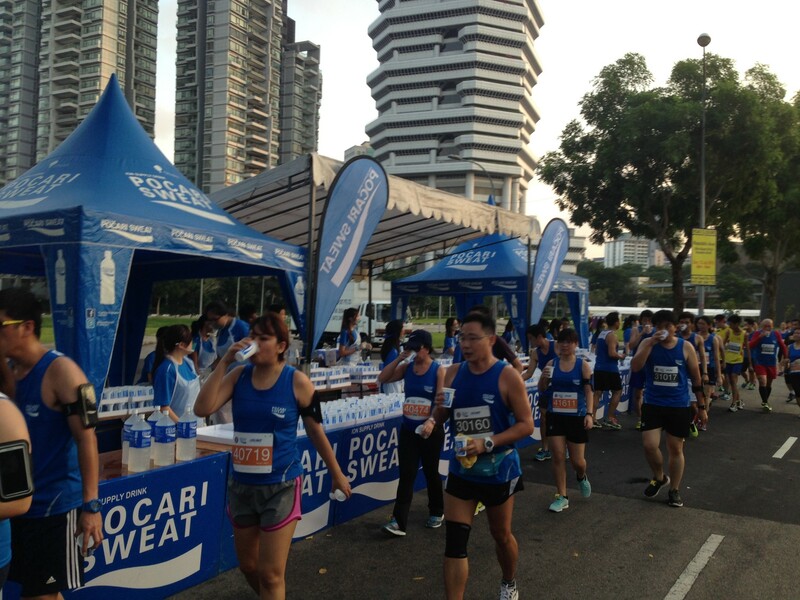 Pocari Sweat Run 2015 – Running with Upset Stomach is Not Fun! | JustRunLah! I woke up at 5 am in the morning, still a little bit groggy after a late night out drinking with PES E and Alcholic, guzzling beer and whiskey. 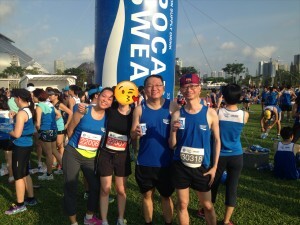 In order to purge the harmful effects of the alcohol to prepare for the Pocari Sweat 10km run the next morning, I downed one litre of water when I got home and promptly went to bed at 12:30 am. Lazy girl was the first (surprise, surprise) to greet us in the morning at 4:59 am in our Whatsapp chat group. 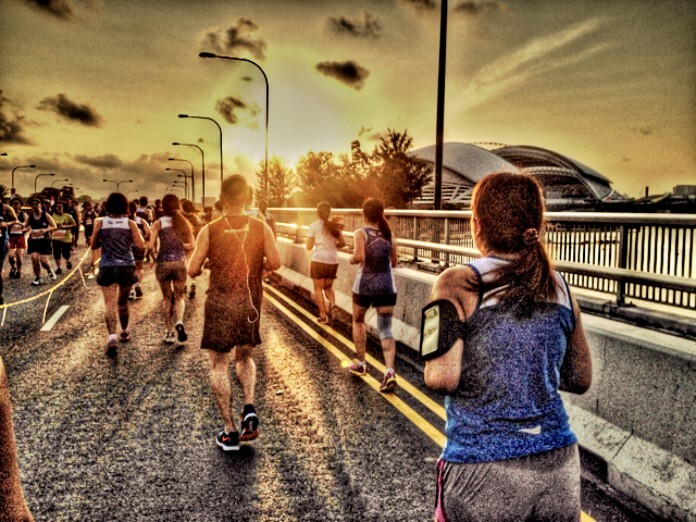 She was taking the chartered bus to the start point and didn’t want to miss it while Fang Tai made her way to the Sports hub via the first train. We were all taking part in the 10 km run so we had to be at the start point by 6:30 am. For Lazy Girl, doing a 10km run is considered as an epic achievement, because she barely survived the Pocari Sweat 5km run a year ago. 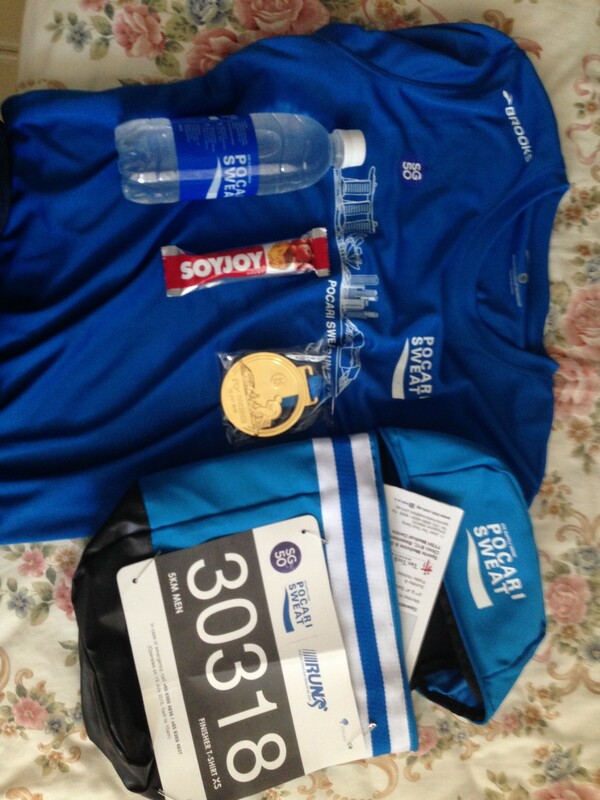 Meanwhile, PES E was downgraded to the 5KM run due to his knee injury. I replied “Morning” and proceeded to the bathroom for my morning routine. However, there was a queasy feeling in my stomach and so I sat on the throne for a couple of minutes, tried hard, but achieved nothing for all that effort. I took a quick shower, put on my running gear and left home. When I reached the MRT station, I realised that I was too early for the first train, and so I sat down to wait for another 20 mins on the deserted platform, unwilling to fork our $20 bucks for a cab ride down to the Sports Hub. Meanwhile, Lazy Girl and Fang Tai messaged that they were already at the start point. 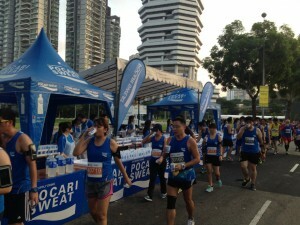 The only consolation was that I noticed more and more runners clad in Pocari Sweat blue, started to gather on the MRT platform. At least there would be a bunch of other runners who would be as late as I. When the first train finally arrived, more than half the passengers were runners and I plonked myself on a seat and tried to catch more sleep. When the train finally arrived at Stadium MRT station, it was already 6:26 am, leaving only 4 minutes for me to dash to the starting point. My stomach was still not feeling well. Was it the deadly mixture of hamburger, beer and whiskey the night before? As I followed the stream of blue past the underpass and towards the start point, I contemplated going to the toilet first. However, I could not spot any nearby ones at the Kallang Practice Track. “Heck it, just run first and if it gets unbearable just run to the nearest toilet.” I said to myself. 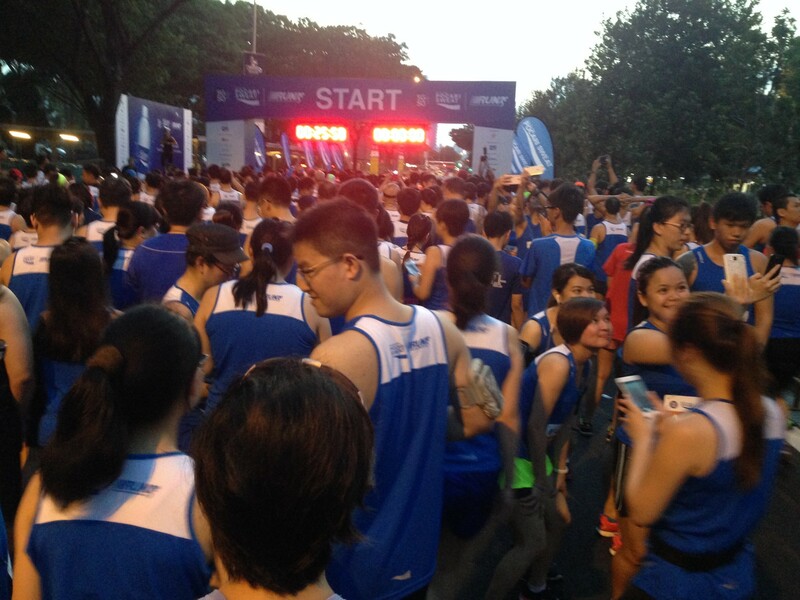 I started my run around 12 mins after the initial wave was flagged off, and so there was already a sea of blue in front of me, taking their own sweet time, probably planning to stroll for the entire 10KM. I sped up and overtook the walkers ahead. As I neared the 1 km mark, I saw mobile toilets set up along the route with short queues and was tempted to join the queues. However, since the uneasy feeling was still bearable, I shouldered on. 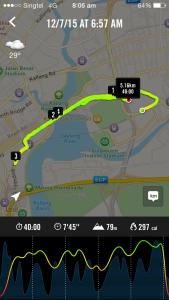 The route took us through the Nicoll Highway, Singapore Flyer, Helix Bridge, Gardens by the Bay, Marina Barrage and back to the Kallang Practice Track via Bay East Garden. As I got into my “running rhythm”, the desire to interrupt my run and visit the loo started to abate. 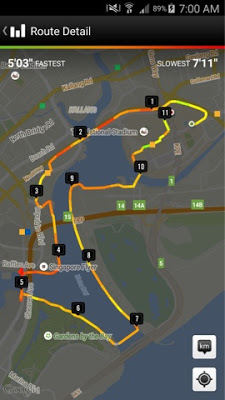 After all, the faster I finished my run, the faster I could relieve myself. While running along the jogging path at Bay East Garden, my Nike+ app dutifully informed me that I had covered 9 km with 1 km to go. 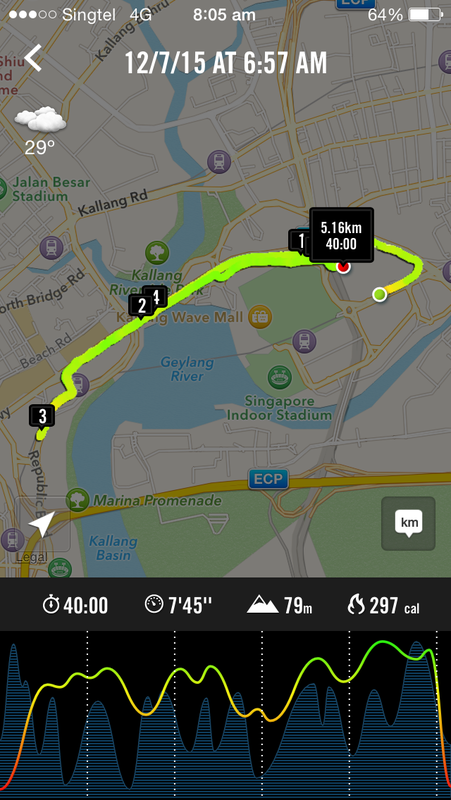 However, I knew that there was still quite a distance to the finish point which was also at the Kallang Practice Track. 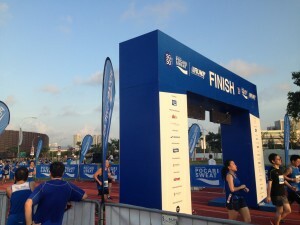 Could they have shifted the finish point? I got my answer 1 km later. The 10 km marker was placed at the bridge leading towards Singapore Indoor Stadium with no signs of the finishing point anywhere and I was made to run another 1.5 km, with the contents of my last night’s debauchery threatening to burst open. 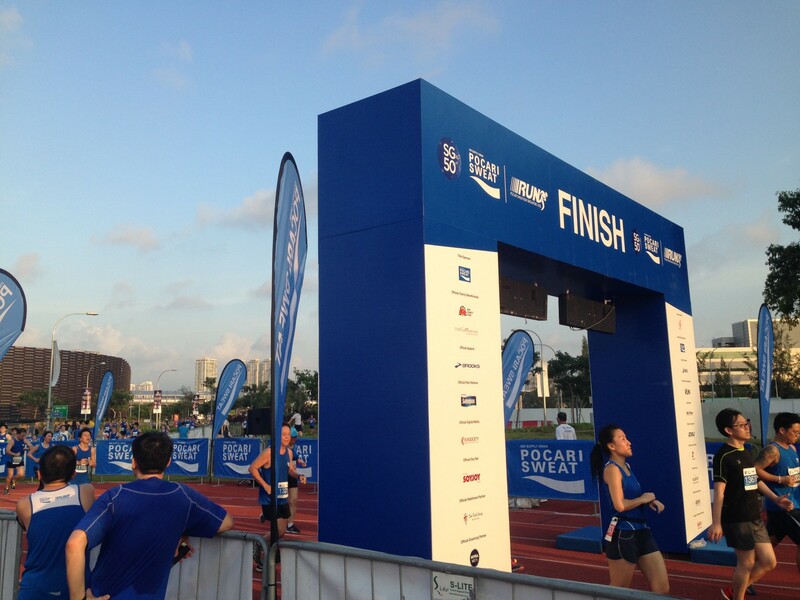 I was cursing under my breath as I willed myself to finish the last 1.5 km around the Singapore Sports Hub and to the finish line with a good timing of 1:08:24, which was quite an accomplishment considering the suffering that I was undergoing during the run. After collecting the finisher tee and medal, I proceeded to drink copious amount of Pocari Sweat since I heard that isotonic drink is a good treatment for an upset stomache. 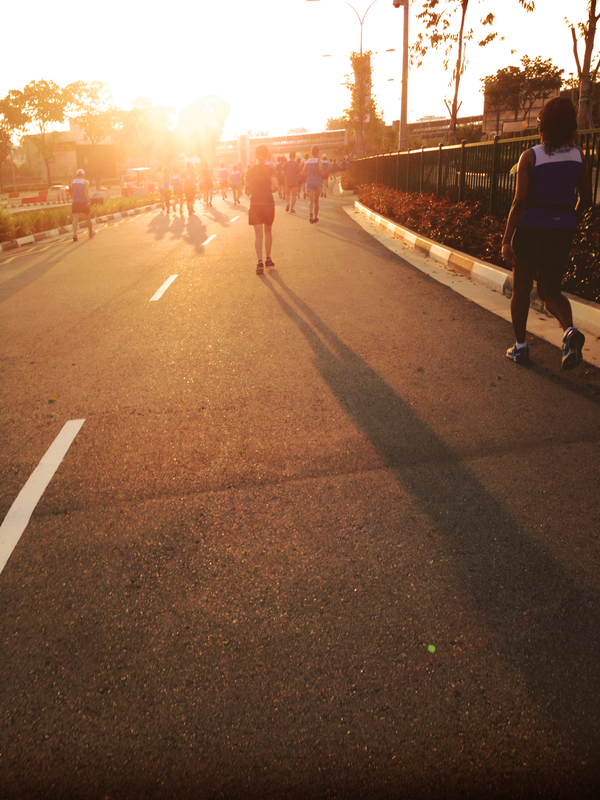 PES E, who started at 7 am for the 5 km run, came back first, followed by Fang Tai and Lazy Girl. 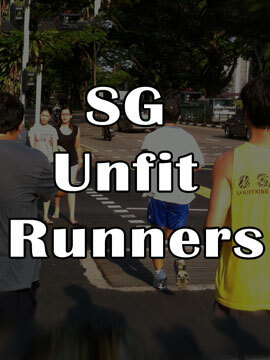 All commented that it was a relatively good run, except for the summer heat and the extra distance.